I am definitely in the ‘less is more’ mind set when it comes to railway layouts. There needs to be enough going on to be interesting but not an overload. I like to see trains going by so a loop is essential. But, with that said, possibly an end-to-end layout, featuring a railcar or some form of multiple unit(s) would work too. An automated shuttle set up in that case would be required. In addition, the possibility of some shunting action also would form my ideal setup. 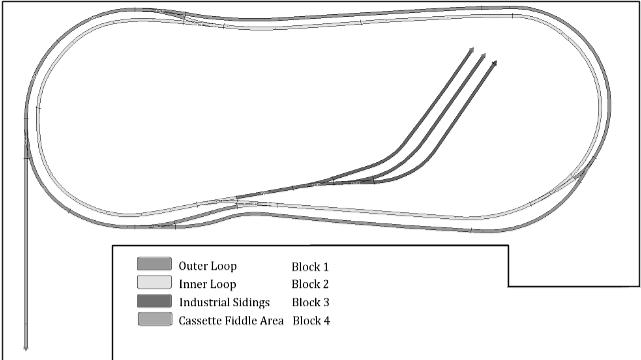 The plan above includes 2 loops, with three places where a cross over can happen, then in the centre is the industrial area which forms an Ingle Nook configuration. I am fairly sure that I will need to add some way of turning locos around and I prefer the idea of a turntable over a reversing loop. I don’t quite know yet where I will add that. The layout does not include a fiddle yard but does include a cassette area instead. with a station in the lower right. None of the above is cast in stone and all may change. Right up until I finish laying track, changes can and likely will happen.